Now this is a totally cool lamp from JacarandaStyle. 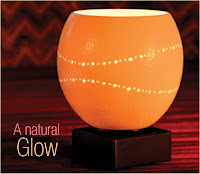 I know, I know, it's not a gadget like those LED candles I have had my eye on and it is made from real ostrich egg shells but I do like to go natural sometimes. This unique Ostrich egg lamp is hand painted, polished and carved and would make perfect conversation pieces in your home. If you're designing your home, this ostrich egg lamp would also go well with LED lights to bring soft lighting to your home. This will probably bring a romantic atmosphere which I really like in a home rather than bright fluorescent lights. However, I do hope that they collect the egg shells AFTER the Ostrich is hatched since that would probably be considered poaching if they don't. Anyways, there are other beautiful and unique hand-made home accessories and jewelry from JacarandaStyle and they are all made in South Africa. JacarandaStyle also donates a portion of every item sold to the Ethembeni School in South Africa (www.EthembeniSchool.org) which serves 300 physically disabled and visually impaired children in South Africa so you would be helping out these children whenever you buy from JacarandaStyle. The company has also been featured in publications such as Food and Wine, Traditional Home, and The New York Times so the pieces you see might look familiar. If you do decide to buy from them, you can get a 10% discount if you use the coupon code, JSTYLE. This coupon code is valid until December 14, 2007.